My offer: A classical education for riders and horses that respects the horse’s mental and physical capabilities. It starts with the a skilled rider and results in a supple, balanced horse that is a pleasure to work with. I teach with special regard to individual circumstances as well as correct biomechanics. No previous knowledge of the Academic Art of Riding is required and riders on any level are welcome. I have as much fun improving communication as I have working on dressage exercises. The Academic Art of Riding can help horses of all breeds and all ages. I drive around the Warsaw area for up to 50km from Warsaw city center to give lessons. If you live further away please have a look at the courses page. Always go with the horse, not against him. Always listen to what the horse is trying to say. “Always go with the horse, not against him. For the development of a true partnership, we have to understand the horse’s point of view and learn how to clearly communicate our intentions to the horse. Groundwork opens up a whole new world for your training, you will be surprised! After we established a good mental connection with our horse, it’s time to move on to body work and improving shape and balance. In the Academic Art of Riding, this work is done on a cavesson and with a rope attached to the middle ring. Before the horse is mounted for the first time, he learns the basics of bending, finding balance on a circle, moving in shoulder-in and quarter-in and starting to collect. Every horse that is started with academic work is worked as a “young” horse, regardless of age of previous training. Groundwork opens up a whole new world for your training, you will be surprised! I never use any kind of side rein and instead focus on teaching the horse how to keep his own shape. It takes only a little bit of effort but lasts for the horse’s lifetime. Lunging is something that everyone is doing and that is thought about very little. 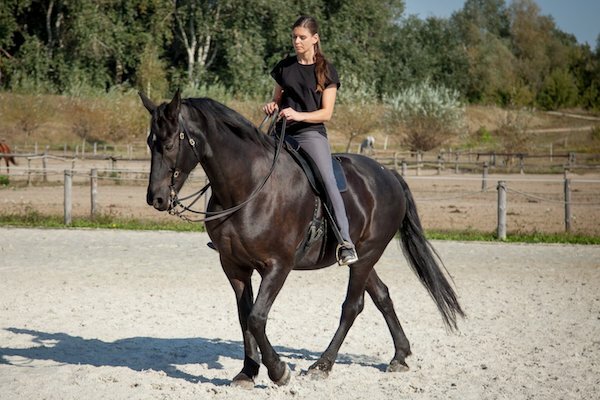 However, the horse needs a lot of skills to be able to manage a circle in balance, especially at a trot or canter. We have to address his natural asymmetry and how he can deal with the influence of the centrifugal power. 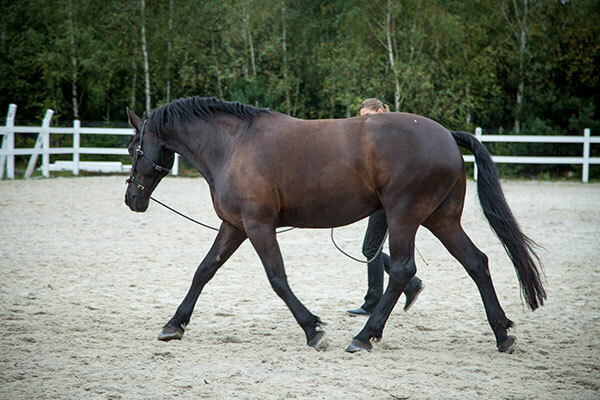 So called “lunging aids”, the different rope constructions or side reins, are no help at all and rather press the already tense horse in an uncomfortable position, putting the horse under unnecessary stress and causing lots of frustration. I never use any kind of side rein and instead focus on teaching the horse how to keep his own shape. It takes only a little bit of effort but lasts for the horse’s lifetime. In the Academic Art of Riding, our goal is to ride the horse only from the seat! I like to think about riding as just another leading position from which I communicate with my horse. The riding education is first of all a seat education of the rider – learning to go with the horse and to feel the horse with your seat. Thus, we first focus on receiving rather than producing. Only then, when we have a full understanding of how the horse moves under us, do we start to take influence on the horse’s shape with your aids. There is so much to learn; the development of a good seat is a life-long journey! Here, just as in the other areas of working with the horse, lightness must start with lightness – and the basis for lightness is understanding, for both human and horse. In the Academic Art of Riding, our goal is to ride the horse only from the seat! You can use work in hand to introduce your horse to a bit, to introduce new exercises, and to fine-tune your communication. Work in hand is done with a bit or a bitless bridle, with you walking next to the horse and keeping the reins as if you were riding. In the Academic Art of Riding, the work in hand is used as a successor to the pilar work of the old masters. You can work your horse in movement or on the place (getting closer to pilar work), and leading from the inside (horse is bent towards you) or from the outside (horse is bent away from you). You can use work in hand to introduce your horse to a bit, to introduce new exercises, and to fine-tune your communication.